I recently redesigned my blog, and one of the features I was excited about adding was a rotating Instagram widget. I love pictures and Instagram is easily my favorite form of social media, so I thought it would be fun to show some of those Instagram photos on my blog. I didn't have a clue how to do this, but thanks to a little Googling (how did we survive pre-Google? ), I realized it really is quite simple. I thought I would share a step by step tutorial in case any of you fellow bloggers out there are interested in doing the same! 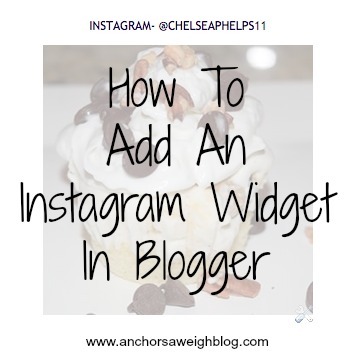 First of all, what exactly is an Instagram widget? Well, it's this. I chose a slideshow widget, which means it rotates through pictures on my Instagram feed every few seconds. You also have the option to showcase your pictures in a grid, whereby it will display several pictures at one time. It's up to your personal preference. Either way, it will only take a couple of minutes, so let's get started. 2. For the first three entries, enter your Instagram username, leave the hashtag field blank unless you have a specific hashtag you use regularly, and select either slideshow or grid. Slideshow will give you the rotating effect (like I have). Grid will display multiple images at one time. 3. Select your thumbnail size. You want it slightly smaller than the width of your sidebar. 4. Select whether or not you want a photo border around each picture. 5. Select a background color if you wish- I left mine transparent. 6. Preview your settings. If you like what you see, click "Get Code". 8. Preview your new page layout. If you like what you see, click "Save Arrangement". The widget will update each time you add a photo to Instagram, so once you paste the code initially, you are done. Feel free to let me know if you have any questions! I love stuff like this, thanks for sharing! Oh and I love your redesign! Ooh, I definitely need to do this! i just recently did this - soooo much easier for people to pin images! So I was able to add my IG feed... but it doesn't have it labeled as Instagram or have my username. Advice? Ahhhh, this is awesome, I have always wondered how to do that! :) Thanks so much for sharing with us.